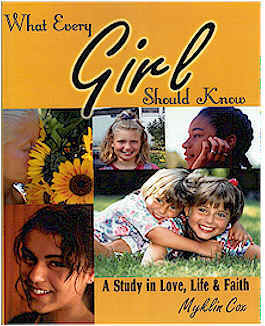 In What Every Girl Should Know: A Study In Love, Life, & Faith, one topic Myklin addresses is the need for young people in world today who exhibit good character, morals, common decency, and respect. Essentially, society's youth lack good manners and social graces. In this chapter, Myklin discusses the Biblical principles behind these topics and how a young woman can practically demonstrate Christ-like behavior in every day life. These issues are critical for a girl to understand as she endeavors to relate, work and interact with all different types of people. Each girl is encouraged and challenged to break the mold of the typical young person out there and become a young woman of character.